Exterior, outside property and house and commercial building checks for assessments of potential problems, reported issues, storm damage, trespassing and vagrancy deterrence, or for verification of completion/progress for services contracted with third-parties. For the Cape Cod property owner’s peace of mind. 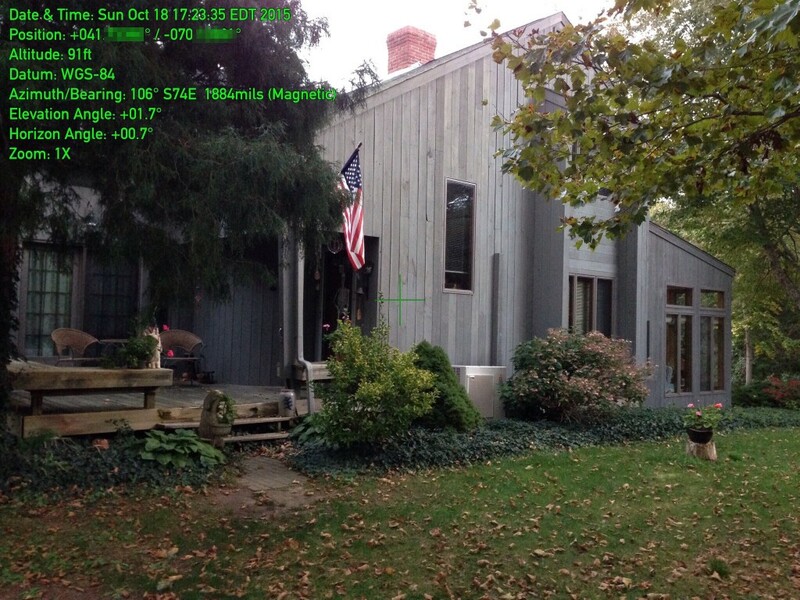 Includes time stamped GPS position and digital images of the property for verification of patrol service. 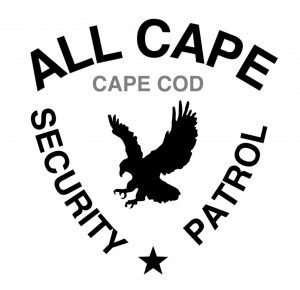 One of our private security patrol units will conduct an exterior inspection of your Cape Cod property and deliver a fully detailed property check report to you via email. 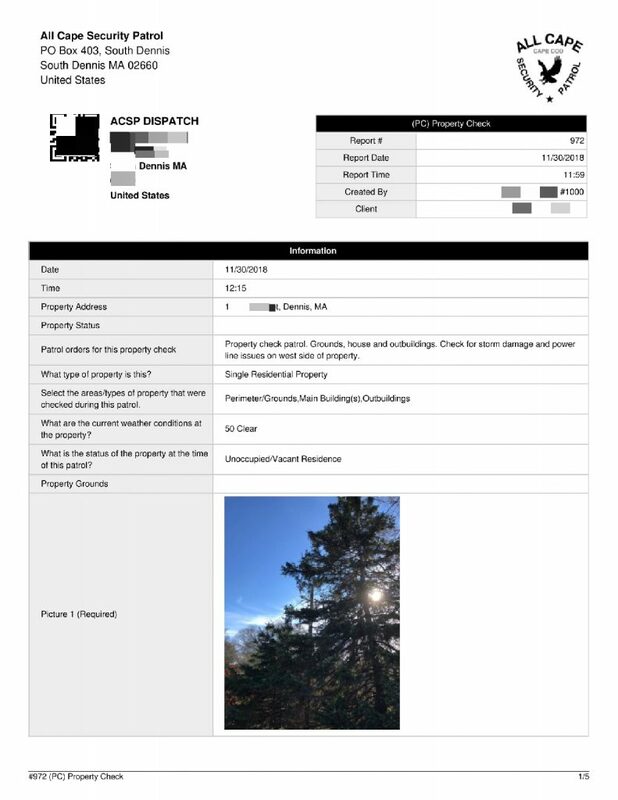 Reports include time stamped digital images of the exterior of the property and detailed images of any potential issues or problems that may be discovered. The visiting patrol unit will check the entire property (doors, windows, outbuildings, yard, driveway access, etc…) and will also visually inspect the interiors of all buildings from the outside where reasonably possible. All Cape Security Patrol is a professional security patrol company and our reporting and records keeping is unmatched locally. All of our home watch and property check patrol services include real time reports including GPS tracking, checklists and detailed images of the property delivered immediately to your email right from the property. Optional text message notifications can alert you that we were on the property and that a report has been sent to your email. Our security patrol units will check on any type of private property. In addition to vacant houses and cottages, we can also check on boats, RVs, heavy equipment, construction sites, commercial buildings and more. Just let us know what you need checked. **See our regularly scheduled interior/exterior home watch services for vacant properties that require regular interior inspections. For regularly scheduled contract patrols, home watch and key holding services please call (774) 383-2030 or email us for a quote. If a patrol agent discovers something that needs to be addressed immediately, the patrol unit will secure the property and contact you while they are at the site to discuss an appropriate plan of action. 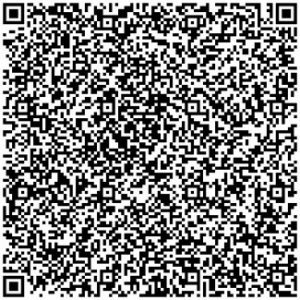 RVs, heavy equipment, construction areas, etc. You may customize the patrol orders for your Property Check report to have us inspect a particular area, conduct the patrol in a certain way, or capture certain images of the property. Just let us know what you need. Get your Cape Cod property checked whenever you want to. No contract. Standard response and reporting time is within 24 hours of ordering. Priority response and reporting is available anytime you need your property checked as soon as possible, day or night. ** Forces beyond our control like severe weather, storms, road and traffic conditions may affect response times. *** To add your property to a regular security patrol route for any length of time and/or frequency, please contact us or call (774) 383-2030 for contract rates. **** Cape Cod security patrol services are available for scheduled contract based exterior property checks and home watch services are also available for scheduling regular interior inspections of vacant properties.